Marble is one of the most commonly used materials for surfacing floors in a luxury condominium unit. A natural stone floor is not only elegant in its appearance; it is also a wonderful investment in the property itself. A beautiful marble tile floor is not as expensive as most people believe. Marble is an extremely heavy stone material, and shipment from a quarry or manufacturing site comes with a high price tag as a freight charge. However, a direct importer and distributor receives and delivers bulk shipments on a constant basis, making this product more affordable than in years past. 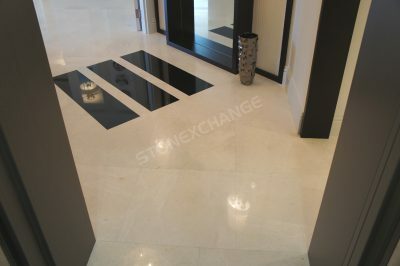 Stonexchange is a Florida-based importer that caters to commercial clients throughout the United States, and we offer some of the lowest prices on high-quality marble. Marble has been used as a material for floors, walls, counters, and tables for hundreds of years. Its durability is witnessed in the many buildings constructed during the days of the Roman Empire, many of which remain intact into the 21st century. Large construction projects calling for a luxurious indoor environment often include building instructions containing plans for a natural stone floor or countertop. One of the great benefits of using marble is that several different shades can be utilized in different areas of the condo unit. A combination of light and dark shades work very well with other room accents such as lightly colored walls and medium shades for the cabinetry and shelving. At Stonexchange, we carry not only a full line of marble tile products in all the popular color shades, we also have all the standard sizes of marble thresholds and marble window sills. It has become a simple process of ordering all the natural marble stone needed to design a custom, elegant interior for a modern condo unit. Perhaps the greatest benefit of using marble as a flooring or countertop surface is its lasting quality. Natural stone does not weather and fade when used as an indoor surfacing material. Marble has a very lustrous appearance that is the result of different compounds being compressed together over millions of years. Igneous processes also contribute to its shine and overall beauty. Once installed, marble tiles will likely outlast the rest of the structure. When older buildings are sold and the indoor materials auctioned, marble often goes for the highest price. This is because natural marble stone retains its original appearance for many decades. Less durable materials such as linoleum, hardwood, and Formica will eventually show cracks, will bow under pressure caused by water intrusion or temperature/humidity changes, and are subject to scuffing. Replacement of any type of floor surface or countertop is an expensive procedure. A floor or countertop surfaced with natural marble stone will not chip or crack, will retain its high-polish, and serves as an excellent starting point for creating new accents when it comes time to redecorate the premises. Feel free to contact us to help you choose the perfect marble tiles for your apartment.